This guide shows how you can install and use BleachBit on an Ubuntu 9.04 desktop to delete unnecessary files. BleachBit deletes unnecessary files (such as cache, cookies, Internet history, localizations, logs, temporary files, and broken shortcuts) to free valuable disk space, maintain privacy, and remove junk. It wipes clean Adobe Reader, APT, Bash, Beagle, Chromium, Epiphany, Firefox, Flash, GIMP, Google Earth, Java, KDE, OpenOffice.org, Opera, RealPlayer, Second Life viewer, Skype, VIM, XChat, Yum, and more. The BleachBit site admonishes that 0.5.0 is: "an unstable release intended only for testing." While a many apps are quite usable at this stage, many are not. 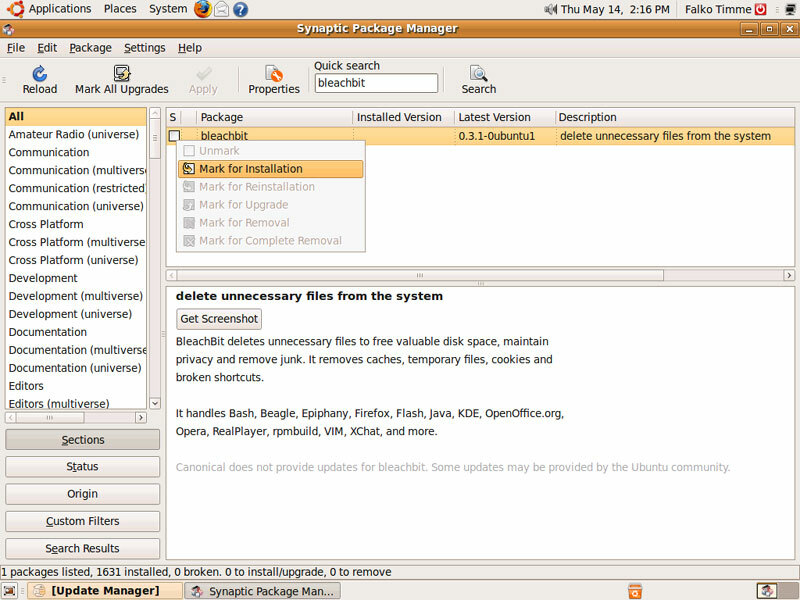 Therefore, Falko rightly pointed to the stable version in the Ubuntu repository for most people. 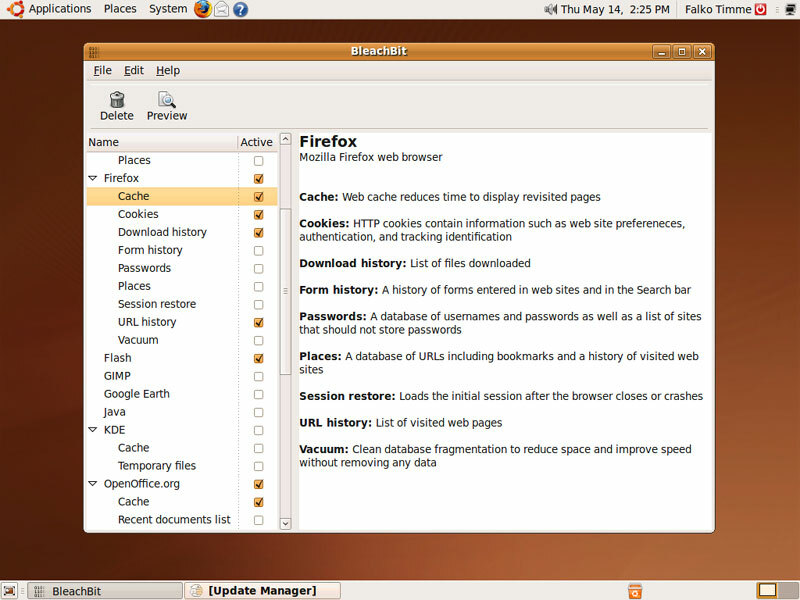 A fast reading of their release notes shows that most features refer to improvements under various versions of Windows, not Ubuntu (see http://bleachbit.blogspot.com/2009/05/bleachbit-050-released.html) So I personally see little value to running 0.5.0 under Ubuntu. Of course, I could be wrong on this last point. Do you see something I don't? Aside from the command-line invocation feature which is not complete as yet, that is. OTOH, 0.4.0 introduced several worthwhile new features, and 0.4.2 is the last stable, maintenance version before 0.5.0. That may be a better choice if someone wants to link to a version outside the repos. 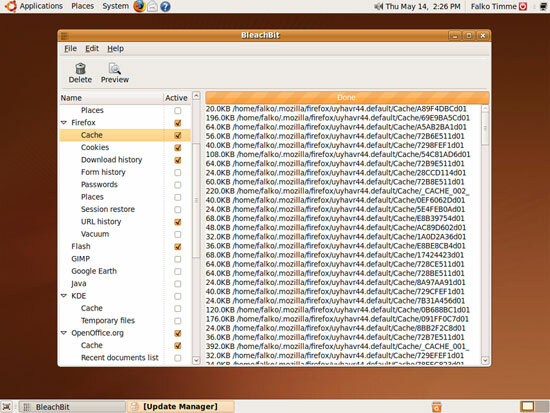 thats the problem with ubuntu. you start off with repo`s and then end up installing debs from elsewhere for lack of any updates in the repos. "thats the problem with ubuntu. you start off with repo`s and then end up installing debs from elsewhere for lack of any updates in the repos." As opposed to...? Windows? OS X? Neither of those OS's provide application-level package management that's anywhere near what the deb/apt system provides. You need to count on each app to have its own upgrader. Many (but unfortunately not all) third-party .deb files are available from the authors' repos, which can be easily added to the /etc/apt/sources.list (or sources.list.d/). 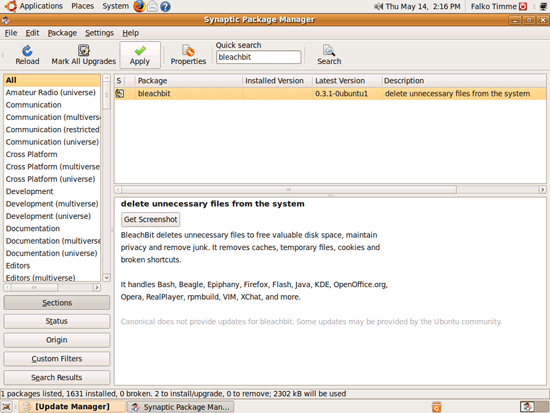 So, you're not locked in to just using the stock Ubuntu repos. But, even without a repo, you can still install a .deb package and know that apt-get and friends (aptitude, etc.) will still know exactly what you installed on your machine, and how to cleanly remove or upgrade it when the time comes. It's also easy to roll your own .debs from source tarballs. Just "sudo apt-get install checkinstall" and replace the "make install" step from a from-source install with just "checkinstall". This process is easier than making an installer for Windows or OS X (both of which I've had to do in the past). Ubuntu was specifically designed with newbies in mind. 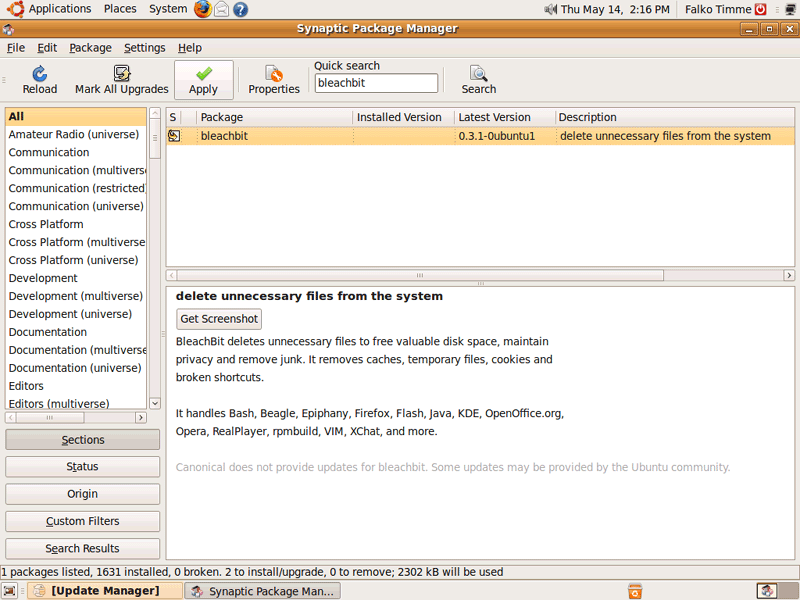 They are advised to stick with the package manager, and not install applications independent of that. The main reason being, they may not be trusted sites, and you open yourself up to damage. 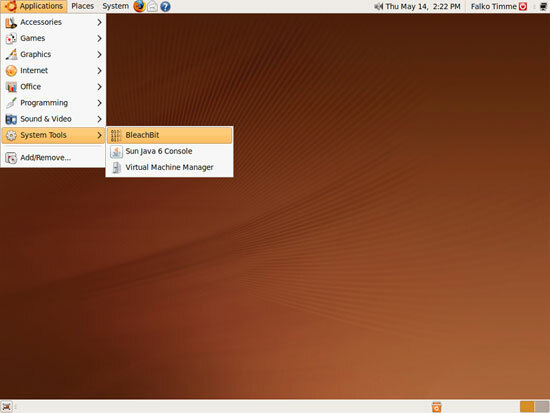 You are treating Ubuntu as an experienced Linux user; you may as well be talking about Debian. In short, this is a mixed message to new users...not good. I use Ubuntu, and am still waiting for Synaptic to provide the newer version of Firefox! 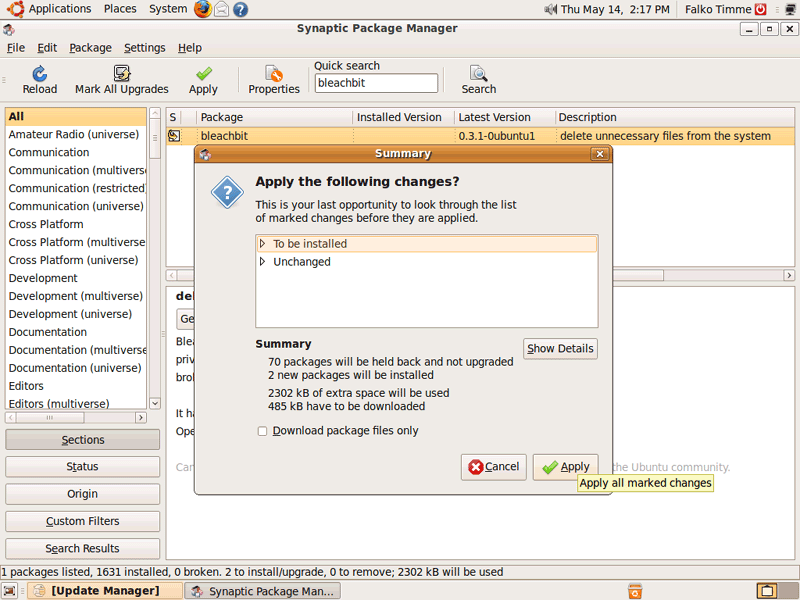 I find this lack of keeping the package manager updated, most disappointing. 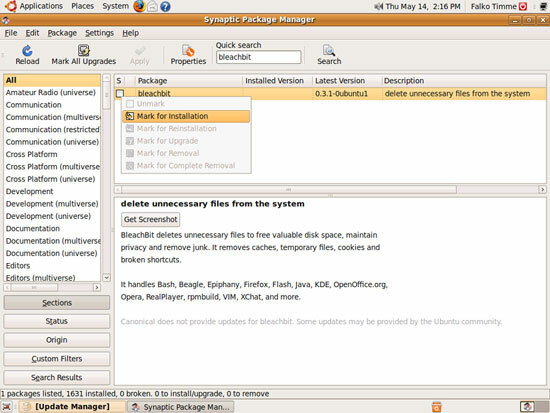 This is not a matter of my not knowing how to download and install applications outside of Synaptic...but a matter of putting new users in a compromised situation, which is not the best way to turn them on to Linux. For that, there is no excuse. A week ago, I would have more likely recommended 0.4.2, but 0.5.0 had few changes for Linux (so less likely to have a regression) and there have been no bug reports. At this point I declare 0.5.0 is stable for Linux and unstable for Windows. For Ubuntu as of today, I recommend BleachBit versions 0.5.0 or 0.5.1 (due out soon). 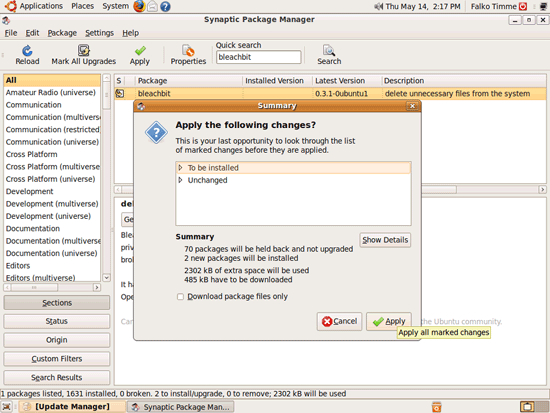 I asked the packager to request a backport of 0.4.2 to the Ubuntu 9.04 repos. We'll see what happens. In any case, nice howto! Step-by-step with screenshots is helpful. Thank you for writing this guide. While the instructions are good for the latest version (the BleachBit interface hasn't changed in a while), Ubuntu 9.04's repository has an old verison of BleachBit (version 0.3.1 compared to 0.5.0). The BleachBit website has a newer package ready to use for Ubuntu 9.04. Is there a stable version that I could use with 8.04 Hardy? If so, where would I find it and how do you recommend I install it? 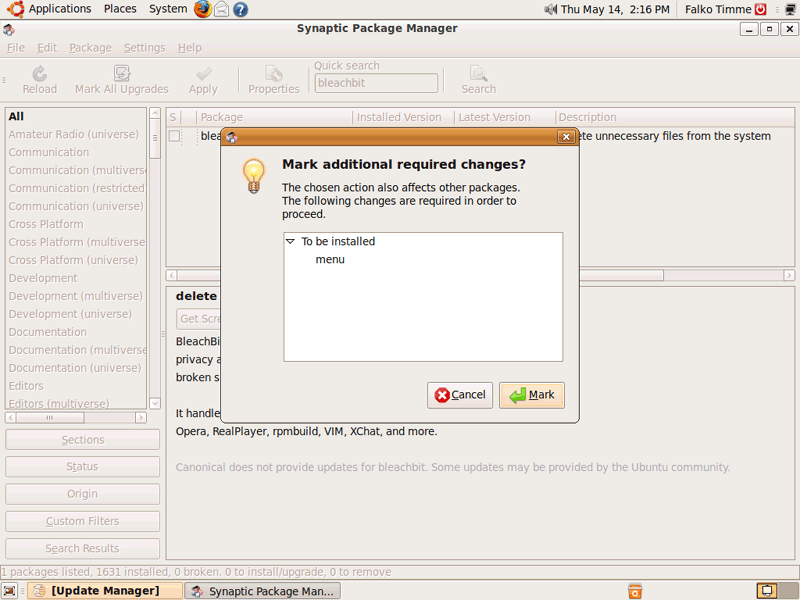 This is the first tutorial for any flavor of Linux I have seen that doesn't throw the terminal/cli out at first chance. If we are going to convert MS dogs to Linux, we are going to have to show them that, while we keep the terminal for occasional use, you are NOT stuck having to use something that reminds Windows 3.0 users of years past what hell was like(read as: using dos). Kudos to you for showing we have choice. Every time I run BleachBit, it removes the "Desktop" toolbar from my taskbar. I have to reload it evry time. I'm using windows 10, upgraded by the newest update, this past week. Can you tell me what to do to stop this?